Unobtrusive entrance to the Newmarket Hotel. 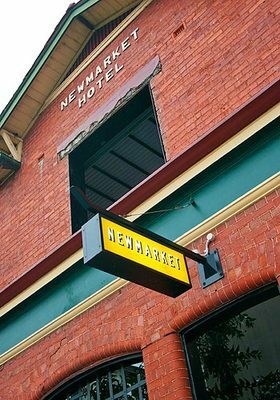 From the minute you find the Newmarket Hote with its distinctive façade, you know you are in for a good night. Tucked away on Inkerman Street, near the junction with Barkly St, you might have driven past many times and never noticed the place, let alone stopped. But stop you should, for you will be truly glad you did. 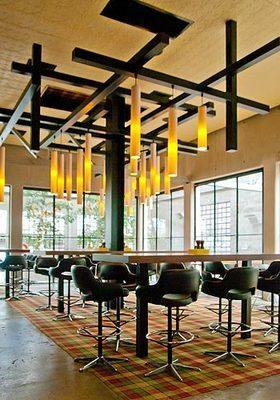 Built in 1868, the "old face" has been recently renovated into a modern space you will want to visit again and again. From the minute we walked in the front steps, three suburban mums out for a bit of R n R on a Friday night, we felt welcome and immediately relaxed. With its wide L shaped courtyard looking out over Inkerman Street, it is easy to imagine the place is a mecca for all the hip young things who flock to St Kilda. But on the night we were there, while there were plenty to fit this category, there was also a true mix across the generational divide and we did not feel out of place at all. The waiting staff were more than a little responsible for this sense of well-being. They were quite simply some of the best staff I have ever come across. We had to wait for a few minutes after our arrival for our table to be ready and so ever so reluctantly (tongue in cheek is harder to pull off when written), we headed off to the five-person deep bar. Our maître lost us in the mix, but did not rest until he rescued us and escorted us safely to our table. Once ensconced in comfortable retro chairs at our table, another waiter immediately appeared to suggest perhaps three ladies out on the town might be in need of some vino? It is a lovely feeling when your needs are so quickly and accurately anticipated. Next our waiter suggested some guacamole ($12) to nibble on while we pursued the rest of the interesting menu. Yes, guacamole. Did I mention the underlying Hispanic theme of the hotel? Whilst not immediately noticeable – there are no colourful ponchos adorning the walls, and I only glimpsed one sombrero on the bar– our first hint was when our champagnes arrived in flat glasses, the kind your parents used to keep in the sideboard. The Mexican theme continued when our wine arrived in a litre carafe and was poured into wine cups. Even the crockery had a distinctive edge. The menu was a little overwhelming, but in a nutshell seems essentially a tapas / sharing style. As we had already eyed of the delicious sounding desserts, we decided not to have any more starters and to move straight to the mains. The girls will understand – it is all about leaving room for the things that really matter. Like wine and desert. For main, we indulged in Barramundi cooked 'Yucatan' style (read infused with flavour), wrapped in banana leaves then roasted in the wood fired oven. It arrived with little individual "tacos" and a jicama and orange salad to complete the taco meal. At $33 per person, if I were prone to clichés, I would say this was heaven on a plate. The other main meal our dining companion ordered was the wood roasted chicken ($35 pp) with autumn leaves, garlic croutons, chestnuts, grapes and pancetta. Some parts of the chicken on the bone were a little pink for our taste, although we were assured it was indeed cooked, and our waiter happily returned the meal to the kitchen for more roasting. The breast pieces were literally mouth-watering. We choose a radicchio, witlof and fennel salad with figs, mozzarella, artichokes and walnut dressing for our side salad ($20). The salad was deliciously rich and made for far too much food, but we could not resist it and the unusual flavours were a treat. Speaking of treats, whilst we were already full, our friendly and patient waiter convinced us we would be doing ourselves a disservice if we did not at least try the desserts. And how right he was. The chocolate and pear cazuela with salted caramel ($14 pp, min 2 people) tasted a little like sticky date pudding, only much much better. Our friend proclaimed to not like chocolate, but even she happily tucked into the Mexican coffee and tequila flan with drunken cherries ($14). 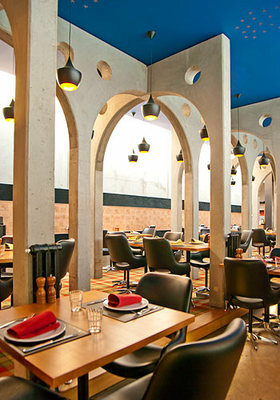 One of many wonderful dining spots. As we happily made moves to head home, the ever helpful staff ordered our cabs and waved us cheerfully off into the night. Why? 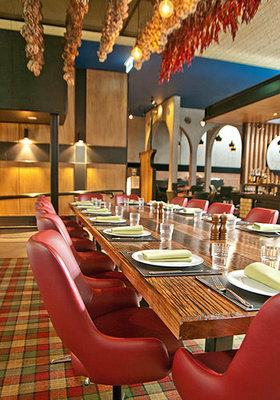 A great atmosphere, delicious food to fill hungry bellies, friendly and professional staff. Cost: We spent $75 a head and were so full we could hardly move from our seats to go home.